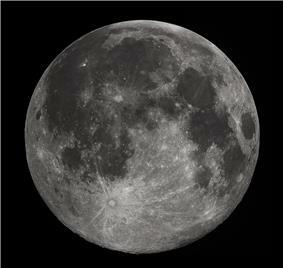 Photograph of the full moon as viewed through a 9.25 inch Schmidt-Cassegrain telescope. This moon was near its greatest northern ecliptic latitude, so the southern craters are especially prominent. Composite image of the Moon as taken by the Galileo spacecraft on 7 December 1992. The color is "enhanced" in the sense that the CCD camera is sensitive to near infrared wavelengths of light beyond human vision. Full moon with reflex camera and telescope Orion 80ED. A full moon is often thought of as an event of a full night's duration. This is somewhat misleading because the Moon seen from Earth is continuously becoming larger or smaller (though much too slowly to notice with the naked eye). Its absolute maximum size occurs at the moment expansion has stopped. For any given location, about half of these absolute maximum full moons will be potentially visible, as the other half occur during the day, when the full moon is below the horizon. Many almanacs list full moons not just by date, but by their exact time as well, usually in Coordinated Universal Time (UTC). 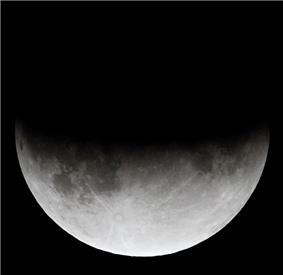 Typical monthly calendars that include phases of the Moon may be off by one day if intended for use in a different time zone. Full moons are generally a poor time to conduct astronomical observations, since the bright reflected sunlight from the Moon overwhelms the dimmer light from stars. 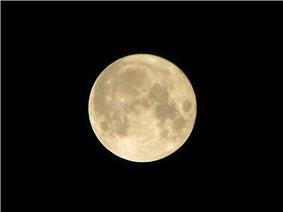 On 12 December 2008, the full moon occurred closer to the Earth than it had at any time for the previous 15 years. Full moons are traditionally associated with temporal insomnia (inability to sleep), insanity (hence the terms lunacy and lunatic) and various "magical phenomena" such as lycanthropy. Psychologists, however, have found that there is no strong evidence for effects on human behavior around the time of a full moon. They find that studies are generally not consistent, with some showing a positive effect and others showing a negative effect. In one instance, the 23 December 2000 issue of the British Medical Journal published two studies on dog bite admission to hospitals in England and Australia. The study of the Bradford Royal Infirmary found that dog bites were twice as common during a full moon, whereas the study conducted by the public hospitals in Australia found that they were less likely. All this is relevant to canine rather than human behavior. 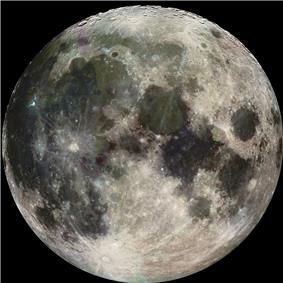 The full moon, as observed from Earth on a clear night. Historically, month names are names of moons (lunations, not necessarily full moons) in lunisolar calendars. Since the introduction of the solar Julian calendar in the Roman Empire, and later the Gregorian calendar worldwide, month names have ceased to be perceived as "moon names". The traditional Old English month names were equated with the names of the Julian calendar from an early time (soon after Christianization, according to the testimony of Bede ca. AD 700). The "harvest moon" and "hunter's moon" are traditional terms for the full moons occurring during late summer and in the autumn, in the northern hemisphere usually in August, September and October respectively. The "harvest moon" is the full moon closest to the autumnal equinox (22 or 23 September), and the "hunter's moon" is the one following it. The names are recorded from the early 18th century. OED for "harvest moon" cites a 1706 reference, and for "hunter's moon" a 1710 edition of The British Apollo, where the term is attributed to "the country people" (The Country People call this the Hunters-Moon.) The names became traditional in American folklore, where they are now often popularly attributed to the Native Americans. The Feast of the Hunters' Moon is a yearly festival in West Lafayette, Indiana, held in late September or early October each year since 1968. In 2010, the Harvest moon occurred on the night of equinox itself (some 51⁄2 hours after the point of equinox) for the first time since 1991. 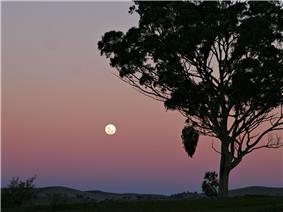 All full moons rise around the time of sunset. Because the moon moves eastward among the stars faster than the sun its meridian passage is delayed, causing it to rise later each day – on average by about 50.47 minutes. The harvest moon and hunter's moon are unique because the time difference between moonrises on successive evenings is much shorter than average. 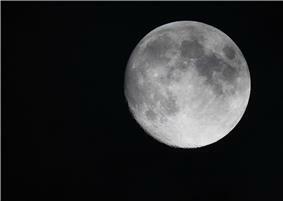 The moon rises approximately 30 minutes later from one night to the next, as seen from about 40 degrees N or S latitude. Thus, there is no long period of darkness between sunset and moonrise for several days following the actual date of the full moon. Such names have gained currency in American folklore. They appear in print more widely outside of the almanac tradition from the 1990s in popular publications about the Moon. Mysteries of the Moon by Patricia Haddock ("Great Mysteries Series", Greenhaven Press, 1992) gave an extensive list of such names along with the individual tribal groups they were supposedly associated with. Haddock supposes that certain "Colonial American" moon names were adopted from Algonquian languages (which were formerly spoken in the territory of New England), while others are based in European tradition (e.g., the Colonial American names for the May moon, "Milk Moon", "Mother's Moon", "Hare Moon" have no parallels in the supposed native names, while the name of November, "Beaver Moon" is supposedly based in the Algonquin). July: "Hay Moon", "Buck Moon", "Thunder Moon"
December: "Oak Moon", "Cold Moon", "Long Nights Moon"
Most pre-modern calendars the world over were lunisolar, combining the solar year with the lunation by means of intercalary months. The Julian calendar abandoned this method in favour of a purely solar reckoning while conversely the 7th-century Islamic calendar opted for a purely lunar one. In lunisolar calendars, an intercalary month occurs 7 times in the 19 years of the Metonic cycle, or on average every 2.7 years (19/7). In the Hebrew Calendar this is noted with a periodic extra month of Adar in the early spring.